We all know reading to a child is paramount to his or her development. In my experience as a mother of two, I’m always on the hunt for fun, new ways to teach my kids. One of our favorite ways is listening to audiobooks. Therefore, I put together my top 10 list of the best kids books on Audible. There are several benefits from audiobooks that I would like to share with you. Kids learn to sit still. A byproduct of your children sitting in one place and paying attention to the narration of a book is that they’ll develop a stronger habit of sitting still. Even my two-year-old has shown improvement in his ability to sit quietly when the need arises. This comes in handy when you’re in a public place such as a waiting room or classroom. Also, audiobooks expand a child’s vocabulary. Children are often introduced to new words in context and with their pronunciation. Often these books promote education, behavior, language, mathematics, etc. It also gives your child a fresh form of media besides a screen. While reading to your child at bedtime is a vital bonding experience, audio books for kids create another dimension of imagination and education without the addictive side effects of screen time. 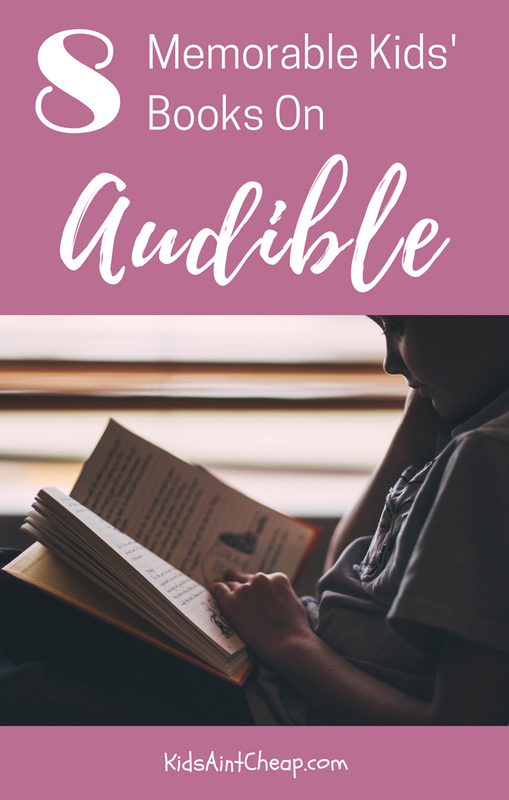 Let’s take a look at some great audio books my kids enjoyed over the last few years. Despite its small size, the little engine used the power of positive thinking to conquer a mountain. This lesson is great for every generation of kids and can be enjoyed on audio with the rich tones of Mike Ferreri narrating. This beloved classic exposes your children to the adventures of Peter Rabbit and his woodland friends. On Audible.com, you can now enjoy the entire Peter Rabbit collection for a very low price. What was your favorite Dr. Seuss book as a child? Well, now it might be available on Audible for your whole family to listen. These best-sellers have stood the test of time for six decades. This classic story is so enjoyable to listen to, due to the dynamic narration performed by award-winning actress, Anne Hathaway. She brings an “all-in” devotion to each character that will capture your kids’ attention (and yours, too!). Why am I putting one of the most popular children’s books on this list? Two words: Jim Dale. Never have you heard an audiobook until you’ve been read to by award-winning voice talent, Jim Dale. Even as an adult, I get a kick out of J.K. Rowling’s great storytelling and Dale’s diverse collection of voices for the memorable characters in Harry’s world. If you believe your child is old enough for the thematic elements of this book, then give the audiobook a shot. Do you have a ball player in your family? I don’t know of anyone who wrote better sports books for middle readers than Matt Christopher. I’d finish a story, and feel a strong impulse to grab a ball and glove and speed off to the park. One of Christopher’s most popular stories, “The Kid Who Only Hit Homers,” is available on audio with a full cast of narrators. This dramatized audiobook is the narrated telling of Tolkien’s bedtime story about the adventures of Bilbo Baggins. Follow his journey with a whole slew of dwarves as they head toward the Misty Mountain in search of their long-lost treasure – guarded, of course, by a fire-breathing dragon. This is the true story of the African-American women who helped the United States win the space race. Shetterly’s book became a movie in 2016 and sends an important message to young people that their minds are precious, no matter their color or gender. Reading is a delight that can last a lifetime. Help your child understand the many layers of literature and the skills he or she will need to get lost in a story and enjoy the endless worlds waiting on the pages. Got your own list of best kids books on Audible? We’d love to hear it! If you’re a stay-at-home mom, make sure you bookmark or pin some of these great resources for later!